More and more companies are beginning to understand the importance of employment branding to their recruitment efforts. If you are reading my stuff, then I am going to assume by now you “get” what employment branding is and the impact it can have on attracting candidates to your company. While it is definitely exciting to see companies embrace employment branding, unfortunately a lot of them do it as a “check the box” exercise. They create some social “careers” channels (and blast jobs through them), redesign their websites (and blast jobs through them) and regurgitate corporate censored and approved “culture” posts once every few weeks between their non-stop barrage of press releases, auto-job postings and executive profiles. “Hey – we are at least doing something” seems to be the consensus train of thought with these companies. Consider me (and most of your potential candidates) unimpressed. It is not simply enough to “try” and “do” but as I have discussed many times over, there is a lot of thought, preparation and strategy that goes into this stuff. With the rise of employment branding, it seems everyone also now gets that video is a very impactful way to effectively communicate your culture, workplace and employee stories. Like I mentioned prior, just because you made a video doesn’t mean it is good – or effective. I am a big fan of employment branding done well, and I will share some examples shortly, but as much as I am a fan of good branding I am also a huge fan of bad branding too. Like the Joker in “The Dark Knight”, some men “just want to watch the world burn”. I see countless examples of bland, meaningless and ineffective recruitment videos constantly. It seems like it is employment branding law that to “check the box” on video you need to create a video of your employees talking in front of a nondescript wall with cheezy muzak playing as they talk in “pre-approved by corporate” verbiage about how much they love their jobs – all for a good 5 – 7 minutes or so. Newsflash – people smell BS a mile away and very rarely will spend 5- 7 minutes watching lobotomized folks pitching to them . Also – if everyone else does this already, how could this possibly help you stand out to your audience? I firmly believe that the most effective content (and video) chooses one of two paths – humor or heart. Think about the content that resonates with you most – whether on TV, in movies, advertisements or simply what you click on in your news feeds. I am willing to bet that the stuff that stands out is either humorous or carries some sort of emotional weight to it. When creating recruitment videos this should be no different in your strategies. Anything besides humor or heart honestly becomes vanilla to consumers and candidates. While vanilla is a tasty ice cream flavor, trust me in saying you don’t want to be it in your content. I believe strongly that the “sell” of a career/job is the hardest sell in all of business. It is a deeply personal, emotional and highly impactful choice in someone’s life. If your candidates have options (they do) and information (they most certainly do) then it is in your best interests when creating recruitment videos to pick a path and strategy that will resonate with your potential buyers (candidates). Humor or heart. I do not believe in publicly shaming, so I will refrain from sharing examples of ones I consider to be “not so good”. These are some over the years I found to be really compelling and well done – and for various reasons I will discuss. Full disclosure – a few of these I was involved in either as an individual or with Red Pill Talent. My list, my choices – but the results (hires, referrals, applicants and awareness) speak for themselves with the choices I picked from my own experiences. I tried to pick from small and larger companies – to show examples across budgets and inherent brand awareness how these can be done well. Let’s roll (these are in no particular order). Twitter – The Future is You! Twitter goes with humor and delivers big time. This video is in essence a parody of recruitment videos themselves. Twitter clearly is looking to attract people who would find this brand of humor attractive, and yet even through the humor they are slyly showing off their culture and some of the office settings themselves. There is a reason this video has as many views as it does. One of my all time favorite recruiting videos. Foundation Medicine, Inc (FMI) works in transforming cancer care for patients. 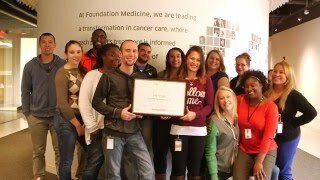 Their employment brand combines their work of identifying each patient’s unique cancers with sharing the stories of their unique employees, hence the hashtag #uniquelyFMI. Clearly this video chose the “heart” path – and rightly so. The mission of joining FMI is very important to who they want to attract, but so is the culture and people who are a part of their company. I have seen this one several times, and each time it gets me. Is it dusty in here? Deloitte – Will You Fit in? I never thought Deloitte would be on any list of companies doing bold and creative employment branding videos but here they are. They took video, mixed it with gamification, and created a very compelling way for candidates to explore work and life at Deloitte. Basically, this is a “choose your own adventure” for prospective candidates – with some humor – that exemplifies their values and the people who could potentially fit in to their workplace. I give credit where credit is due – Deloitte nailed this. CloudLock is a fast growing technology startup looking to attract people to the technical problems they are solving (security) but also to their very unique culture. They chose to take an internal mascot they had been using for years and share what it means to them with the world. The “Chicken Llama” exemplifies what they believe in, but also through humor they are showing their personality and culture too. Like Deloitte, I need to give credit to another company not usually associated with boldness in employment branding – GE. Yes – I love their “Owen” commercials lately and it is exciting to see how much the company invests in employment branding. For me though, this video – with a heart focus for sure – stands out. Appealing to just about anyone with a soul, this very clever video shows the work at GE through a child’s eyes – and the pride in that work as well. Powerful, memorable and disrupting the perception of GE as a pure hardware company cranking out dishwashers. Great stuff. Rapid7 took their core values and created a series of videos around them using iconic movies as their landscape. “Passion” was one of these values, and what movie to better parody to this core value than “Flashdance”? These videos, especially this one, helped Rapid7 stand out in a very crowded tech marketplace for talent and also gave their prospects a better view into the culture of the company at the time. I vividly remember countless candidates asking “where’s the Flashdance guy” when coming in for interviews. “What a Feeling” indeed. I am a sucker for Muppets. Again, here is a company choosing the humor path in their video, and in the case of viewers and awareness they chose wisely. Taking the standard “crap” format most companies typically do (see rant above) they turned it on it’s ear by replacing the actual talking heads with talking Muppets instead. This video went viral fast and got lots of attention. These are just a few examples of companies being unique, transparent and authentic in their recruitment videos – through humor or heart. Don’t “check the box” on your employment branding efforts – be bold.